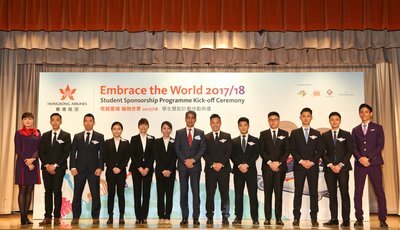 Hong Kong Airlines has launched the 2017/18 edition of "Embrace the World", having held the annual Awards Presentation and Kick-off Ceremony. The strong comeback of the student sponsorship scheme was reinforced by the unveiling of the airline's inaugural Cadet Pilot Programme. "Embrace the World" rewards students with outstanding achievements with free air tickets to give them the opportunity to travel and explore the world. So far, more than 2,000 students have benefitted from the programme. Officiating guests included the Under Secretary for Transport and Housing, Dr So Wai Man, as well as the chairmen of the programme's collaborators - Hong Kong Island School Heads Association, Kowloon Region School Heads Association and New Territories School Heads Association. 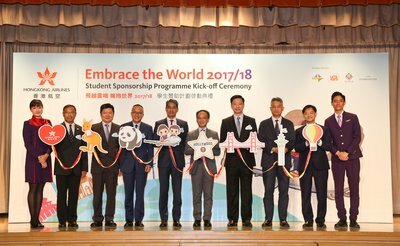 This year, Hong Kong Airlines will sponsor 1,800 return air tickets across five categories: 1) Best Secondary School students; 2) Students with financial difficulties participating in overseas competitions; 3) Primary and secondary school study tours; 4) Kindergarten principals and teachers; as well as 5) Colleges and universities. Hong Kong Airlines will also host several career talks, where secondary school students will get the chance to learn from the airline's frontline staff. Students will be invited to visit an aircraft cockpit and the airline's catering facility to learn about aircraft operations to further develop their interest in aviation. "We're delighted that "Embrace the World" is back and stronger than ever," said Mr Tang King Shing, Vice Chairman of Hong Kong Airlines. "The programme truly embodies Hong Kong Airlines' commitment of nurturing home-grown success." 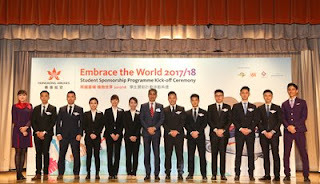 The "Embrace the World" event also saw the introduction of 10 new cadet pilots who were selected to join Hong Kong Airlines' first Cadet Pilot Programme, and will embark on a 70-week flight training at the L3 Airline Academy Training Centre this November. Following completion of the programme, successful cadets will receive their official appointment as Second Officers of Hong Kong Airlines. "Our growing network now boasts nearly 40 major destinations worldwide. Hong Kong Airlines is going through a period of unprecedented growth, and there is clearly a demand for new pilots. We are proud to do our part in contributing to the industry," said Mr Tang. "I'm very happy to be a part of the Embrace the World programme, and together with my fellow cohort, we are honoured to be Hong Kong Airlines' first cadet pilots," said Chester Wong. "While we may come from different walks of life, the 10 of us share the same goal. We want to fly, and we'll work hard to achieve our dreams." The ceremony was also held to recognise those who had participated last year in four categories - "Outstanding School Award", "Outstanding Teacher Award", "Go Green Awards" and the "Best of the Best Student Award", - of which the 10 winners will fly to the L3 Airline Academy Training Centre in New Zealand for a special learning experience.